Members of the Kushner AIPAC Club with their AIPAC National Early Engagement Exemplars Award. For 36 students of Rae Kushner Yeshiva High School in Livingston, their extracurricular support of the American Israel Public Affairs Committee had a special meaning this year. 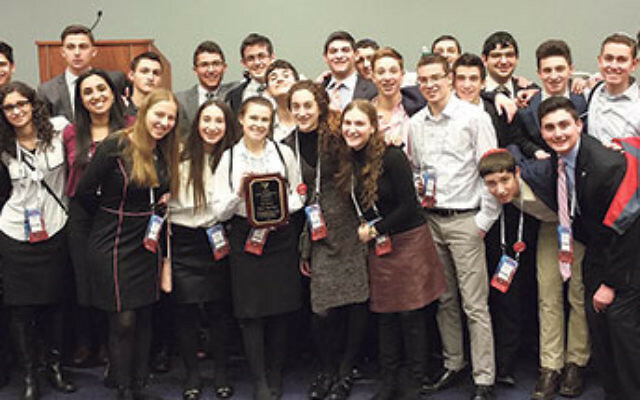 As members of the Modern Orthodox high school’s AIPAC Club, they were cited by the pro-Israel lobby for doing “an outstanding job over the past year helping AIPAC Early Engagement, by engaging in pro-Israel political activism.” Their distinction was given public recognition at the AIPAC policy conference, which took place March 20-22 in Washington, DC. “I am very pleased,” said Rabbi Richard Kirsch, faculty adviser to the group, which has been meeting during lunchtime on Fridays for the past seven years. Kirsch, who is the school’s athletics director and guidance counselor, as well as a teacher of sociology and Judaic studies, shepherded the 36 students through the three-day convention and led them on a visit to Capitol Hill and a meeting with U.S. Rep. Rodney Frelinghuysen (R-Dist. 11), whose district encompasses Livingston. As part of their club activities, the Kushner students “have contacted our congressmen and senators, have lobbied about the Iran nuclear deal, and circulated on-line petitions for measures in support of Israel,” Hirsch told NJ Jewish News in a March 25 phone interview. The three copresidents of the AIPAC Group, all seniors, shared their experiences in e-mails to NJJN. At the gathering, David said, he and the other student delegates found “nothing unexpected” in the pro-Israel positions presented by the presidential candidates who spoke — Democrat Hillary Clinton and Republicans Donald Trump, John Kasich, and Ted Cruz. Shifra and David wrote that they had contrasting views of Trump, his behavior at the conference, and the walkout by 50 rabbis who oppose Trump’s view on Muslims, Mexicans, immigrants, and other controversial issues. Aside from the Kushner group, the other recipients of the award were the Stella K. Abraham High School for Girls in Hewlett Bay Park, NY, and High School Democrats of America.